Little more than a week ago, the S&P 500 tumbled in the second largest down day of the year. By most accounts, that was an incredibly ominous sign and put many traders on the defensive. Yet only a handful of days later, the index finds itself at the highest levels in six months and within 3% of all-time highs. I wrote that last Tuesday and today the market closed 50-points higher. While it was nice to see this rebound coming ahead of time, it is already in the rearview mirror and what readers really want to know is what comes next. Fortunately, the market has been telling us what it wants to do for a while. 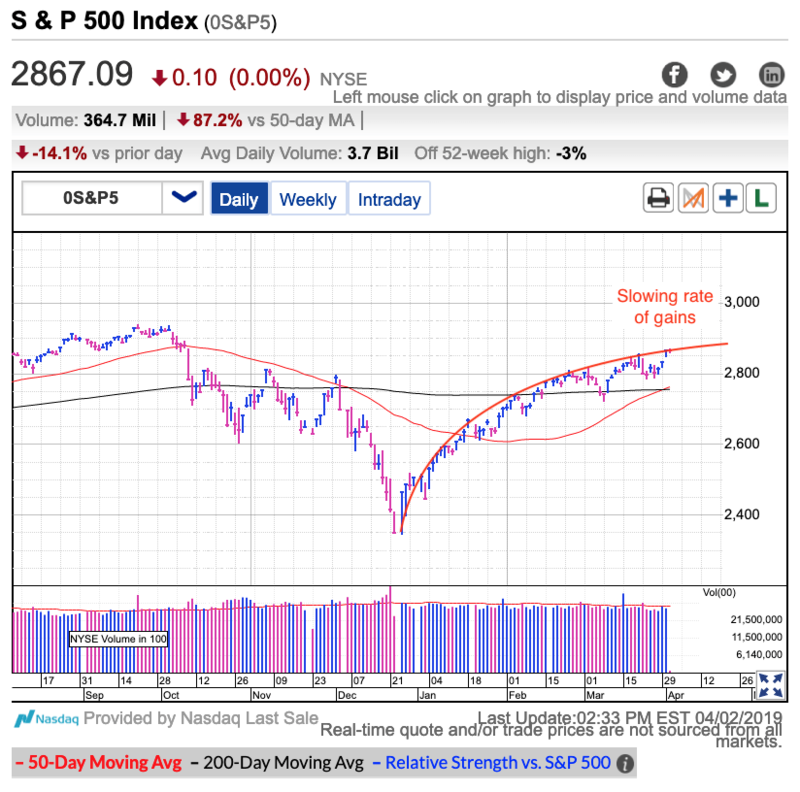 Between the 1.9% plunge two weeks ago and last week’s repeated violations of 2,800 support, the market had more than enough excuses to tumble lower. The bearish headlines of slowing global growth and the weak price action would have crushed us if this market was fragile and vulnerable, yet here we stand. Rather than run scared, most owners shrugged and kept holding. The resulting tight supply ended the selloff made it easy for prices to bounce. Last year’s epic collapse chased off a lot of scared owners. They chose to sell their stocks at steep discounts “before things got worse”. But at the same time they were rushing out of the market, confident dip buyers were rushing in. Those confident dip buyers are the same ones holding today. If they were not afraid of these headlines then, why would they be bothered by them now? They wouldn’t, and is why every attempted dip this year on recycled headlines failed to make a dent. That said, while the path of least resistance remains higher, the rate of gains is clearly slowing. The easy money has already been made. Now things get a lot more choppy. And choppy means challenging. Breakouts fizzle and breakdowns bounce. React to these moves and you will end up buying high and selling low. Choppy, sideways markets are best either held or avoided. This is a good time for longer-term buy-and-hold. Or simply sitting out and waiting for a better risk/reward skew. Chasing these daily gyrations will most likely end in losses as people buy the strength and sell the ensuing weakness. Repeat that a few too many times and the losses will start to add up. This market needs to be traded proactively, not reactively. Don’t fall for its tricks.